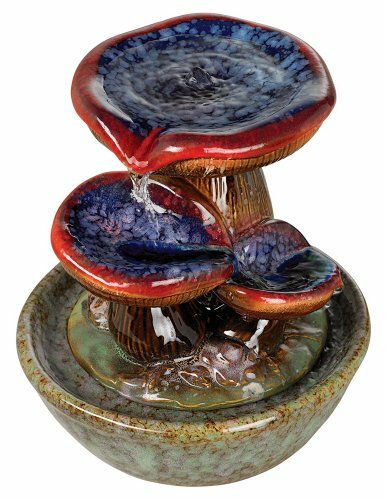 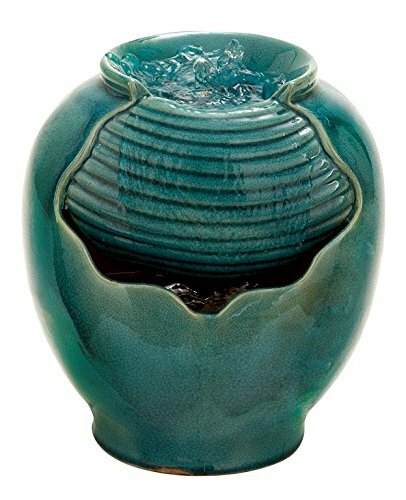 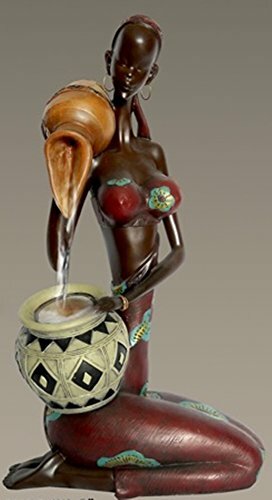 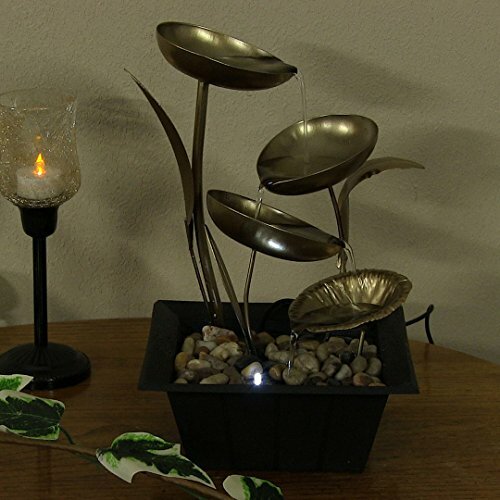 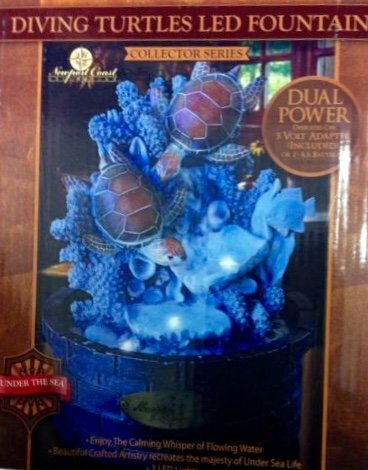 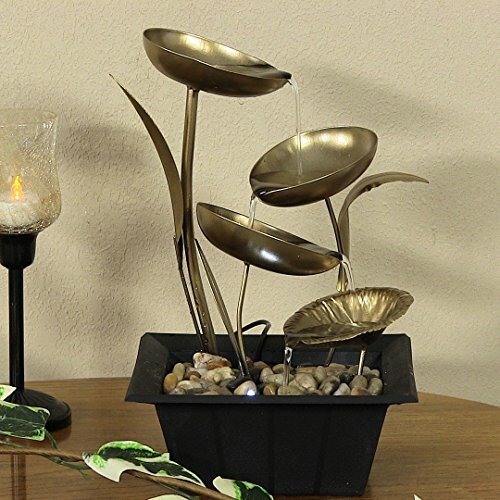 Sunnydaze Four Leaf Cascading Tabletop Fountain, 12 Inch Tall ~ Tabletop Fountains ~ Olivia Decor - decor for your home and office. 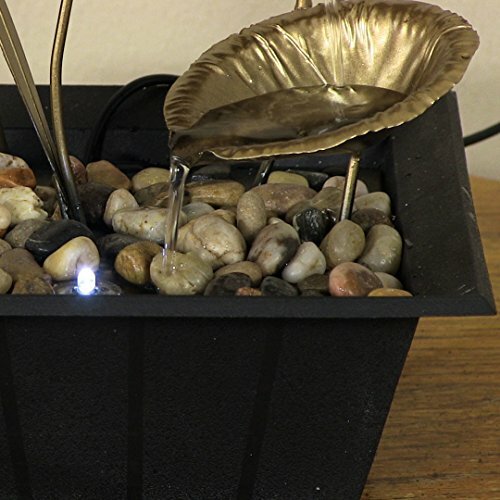 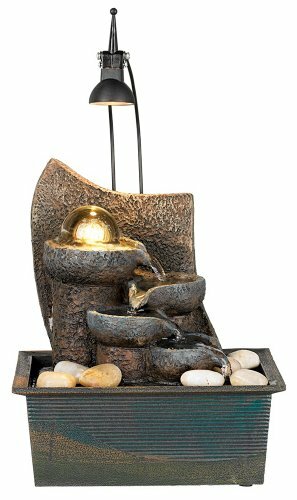 - Contemporary plant-inspired indoor electric tabletop fountain- Features polyresin and brass painted metal construction- Includes 1 fountain, 1 quiet submersible electric pump, 1 LED light, 4 protective foot pads, and decorative river rocks- No plumbing required- Plug into standard indoor electric outlet to operate- Dimensions: 7.75" W x 7.75" D x 12" H; 2 lbsUnique and relaxing are perfect descriptions for this beautiful decorative tabletop water feature, an ideal gift or home decor piece for any table. 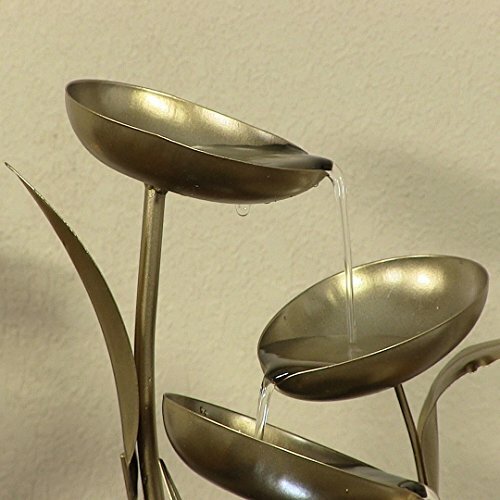 A square, flat-lipped black resin square base filled with river stones/rock holds the main fountain components: four stemmed abstract flowers, made of brassy metal and bowl-shaped, cascading and tiered so water cascades from cup to cup before collecting in the base and being recirculated by an electric pump. 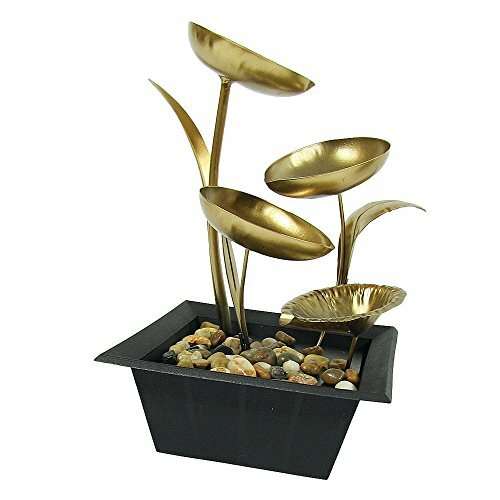 Cattail-like metal leaves provide additional visual intrigue. 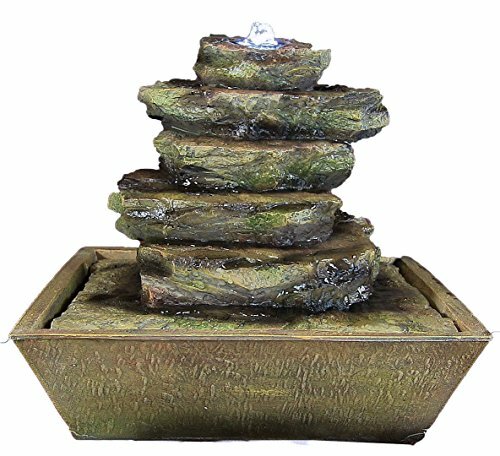 Perfect for waterfall and nature-lovers, this small fountain is also ideal for yoga studios, meditation rooms and other serene "zen" spaces. 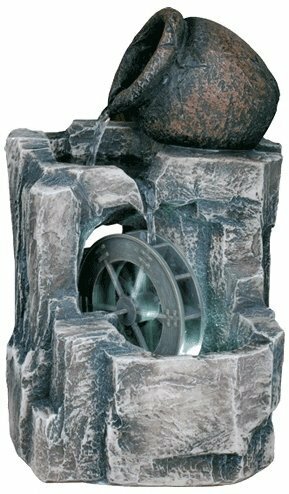 Feature assembles easily, requires no plumbing, and uses a standard indoor electrical outlet. 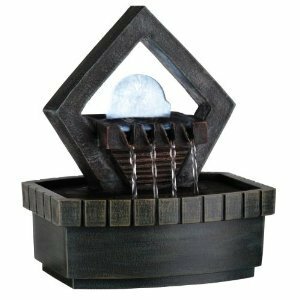 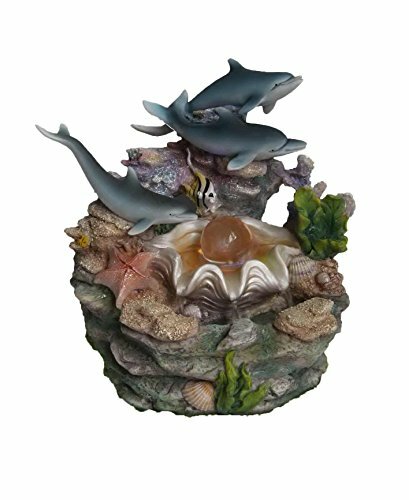 You will love this fountain!Sunnydaze Decor is a manufacturer of high-quality home and garden products. 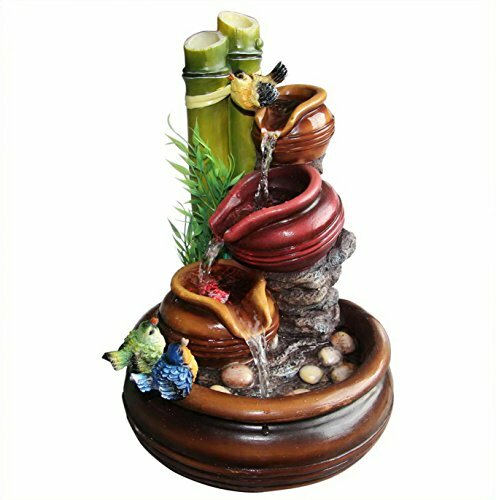 They travel the globe to find the most innovative and beautiful products for your interior and exterior living space. 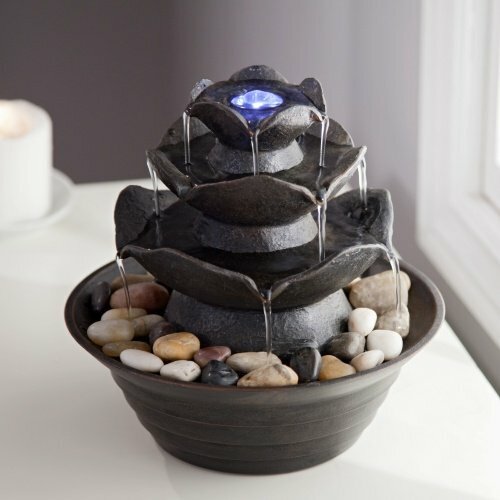 The goal is to provide you with products that truly calm, relax, and bring peacefulness into your life and home. 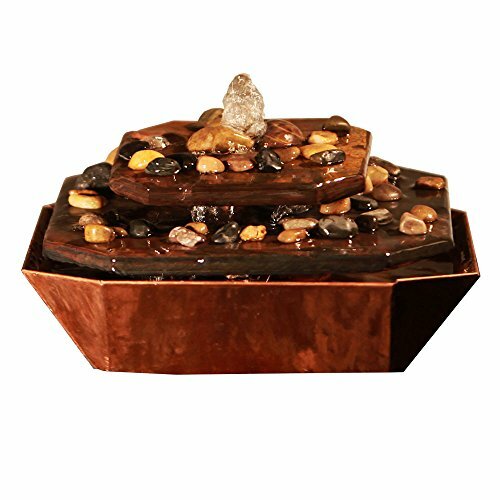 Their talented designers create high end products using a manufacturing process and materials that leave you, the valued customer, with a beautiful addition to your home.They pride themselves on providing customers with a vast selection of products available in a variety of different colors and styles to ensure that you are able to find items and accessories that perfectly match the style and theme of your home's personality.